London Cleaning House is a professional cleaning agency specialised in providing full range of cleaning services to London customers. Our team of house cleaners has over 10 years experience in domestic cleaning for private and business clients and hundreds of satisfied households. All our cleaning employees have public liability insurance, they are crime and reference checked and we are able to provide certificates upon request. We are able to visit your home seven days a week starting at 8 am with the latest appointments beginning between 5 and 6pm. The cleaners are equipped with all necessary cleaning chemicals and technology materials. 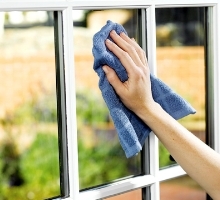 Below you can find detailed information about the house cleaning services we offer. Our team can vacuum/mop all floors, carpets, rugs, and stairs. They are able to remove cobwebs, clean sensitive glass surfaces and empty wastebaskets. The service can include also deep clean of all wardrobes, fixtures, framework, ledges and sills scrubbed. In the kitchen our team of professional cleaners will clean, dry, and shine all appliance surfaces, range hood, and sink. All kitchen floors will be sanitized and polished where applicable. If necessary they will clean the microwave oven inside and out, including turntable. In the bathrooms we scrub and sanitize all floors and surface, including, seat, lid, tank, and base. We remove lime and perform de-scale of any bathroom tile; clean, dry, and shine all mirrors, chrome; clean all shelves, fixtures, and items on the vanity sink.